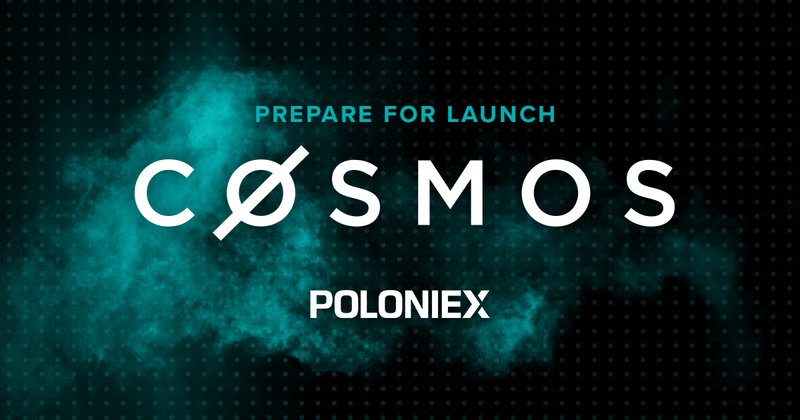 We are excited to welcome Cosmos to the Poloniex family and to be the only exchange to allow Cosmos ICO participants to preview and claim their Atoms’ balance. Cosmos aims to create a network of blockchains all capable of interacting with one another through a consensus engine called Tendermint Core. Cosmos introduces solutions to solve many of the interoperability and scalability issues needed for blockchain applications to reach mainstream adoption. Atoms are the native token of the Cosmos Network. In the initial phase of the Cosmos launch, Atoms cannot be transferred or traded. During this time, ICO participants can preview their Atoms balance on Poloniex. Once the Cosmos network votes to enable transferability/tradeability, customers will be able to redeem their Atoms on Poloniex and start trading immediately. We are providing this experience to give ICO participants a simple and secure way to claim their Atoms and start trading on the first day possible. Once transferability/tradeability is enabled, Poloniex will open BTC and USDC markets to all of our users. Non-ICO participants interested in trading Cosmos Atoms are recommended to create and fund an account in preparation. ICO participants who want to preview their Atoms balance and redeem them on Poloniex as soon as transferability/tradeability is enabled can follow these simple instructions (note that ICO participants who wish to delegate their Atoms to a validator should follow these instructions). 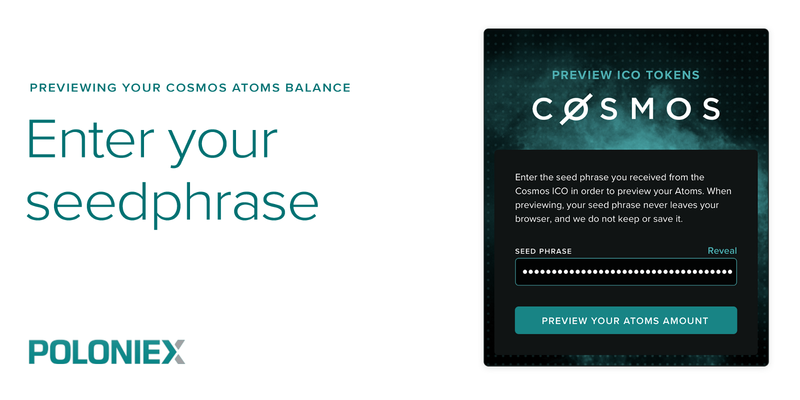 Upon arrival, locate Cosmos and click, “Preview Your Atoms Amount.” You will then be prompted to enter your seed phrase. Note that your seed phrase will not leave your browser and is not stored with Poloniex. Your browser will use the seed phrase to determine your Cosmos public address and then display the amount of Atoms you purchased during the ICO. Once you enter your seed phrase, you will be shown your Cosmos Atoms balance. 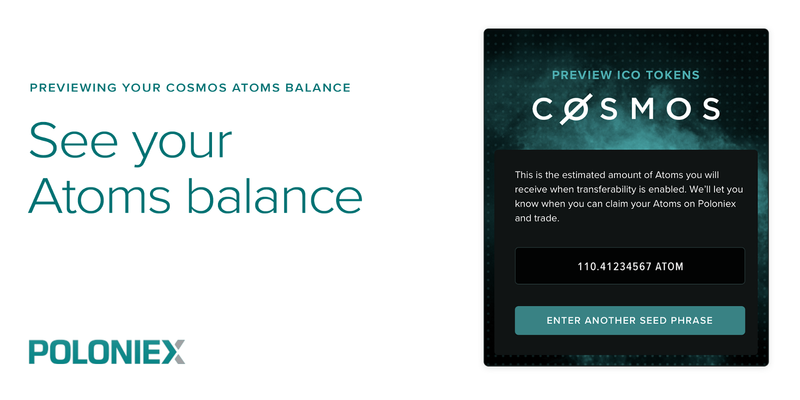 With your balance previewed, you will be notified as soon as the Cosmos Network enables transferability/tradeability and with the click of a button, will be able to redeem and start trading Atoms on Poloniex immediately. This is expected to be enabled in a few weeks time. When claiming your Atoms, your browser will then digitally sign a transaction that authorizes the movement of funds into your Cosmos deposit address on Poloniex. The only data transmitted to our servers is the public key and the signature required to move the funds. Tendermint Core is a consensus engine that allows the Cosmos Network to agree on something (for example, cryptocurrency balance, ownership of a digital good). Developers can create their own custom blockchains using Tendermint, called “zones.” These blockchain “zones” become interoperable with any other blockchain also built using the Tendermint standard by connecting through the central Cosmos blockchain known as the “hub.” These interconnected zones and hub form the Cosmos Network. Where blockchains like Ethereum and Bitcoin secure their networks through Proof-of-Work, the Cosmos Network uses Proof-of-Stake. Instead of miners committing custom hardware and electricity towards solving computations that secure the network, Cosmos validators “stake” Atoms in order to secure the network. Behavior against the security or stability of the network leads to a validator losing their “stake”, which is an incentive for them to act in the best interest of the network. A network of interoperable blockchains secured through Proof-of-Stake can potentially lead to blockchain applications not limited by the interoperability and scalability issues currently faced by major public chains. Cosmos may also address scalability issues for existing blockchains — for example, the Ethereum blockchain is implemented as a zone on the Cosmos Network, giving Ethereum applications improved scalability and transaction throughput. While all of this remains to be seen, it can help explain why such excitement exists around the launch of Cosmos. Poloniex rose to prominence by being at the forefront of supporting and creating markets for new and innovative projects. By the time the exchange was acquired by Circle in 2018, much work was needed to restore Poloniex to its former glory. We’re proud to say that after committing tremendous resources, we’ve completely revamped Poloniex’s infrastructure, stabilized the platform, and have reduced customer support tickets from 200,000 to nearly zero. With the most pressing challenges overcome, we’ve been able to focus more energy on what made Poloniex great in the first place: the curation and support of the most exciting projects in crypto. In addition to adding support for institutional users and allowing prefork trading of the Bitcoin Cash hardfork, in the last few months we’ve been the first exchange to support FOAM and Livepeer, and were the only exchange to support Grin while donating to the Grin General Fund. The support and addition of Cosmos is simply a sign of what’s to come. We have more exciting projects, new features and the return of some old beloved ones in the Poloniex pipeline and can’t wait to share them with you all. Originally published at blog.circle.com on March 14, 2019.